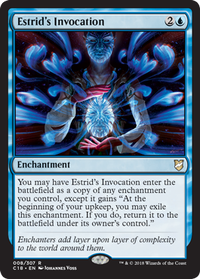 Tragic Poet, is not the solution you want, play Noxious Revival and then you don't need to splash white. Second point Semblance Anvil can make your enchantments cheaper as can Herald of the Pantheon and if you want draw then Eidolon of Blossoms / Commune with the Gods. I guess my point is, if you are splashing anything it should probably be green... Hope this helps, have fun brewing your deck. This look interesting, would Herald of the Pantheon, Semblance Anvil (cost reduction) or Genju of the Cedars (alternative beater) be worth considering here? Or the combo of Urborg, Tomb of Yawgmoth with Spreading Algae? Sram's Expertise is also quite good. I would take out Herald of the Pantheon, as even though you have a lot of enchantments, there are better cards you could play. I would replace Rootborn Defenses with Heroic Intervention too. Hi Natalbee, Thanks for your suggestion. I never thought of adding the unblockable part before. I am going to add Herald of the Pantheon,Eidolon of Blossoms and also Kestia, the Cultivator The +1 tokens do not work optimal with flickerform, since they would be lost when flickerin in my own creatures. Perhaps I should ditch the flickerform concept... hmmm. 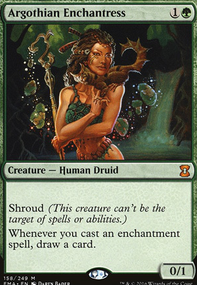 Also I am going for a Glen Elendra Archmage this would be ideal to flickerform and add some more counter. 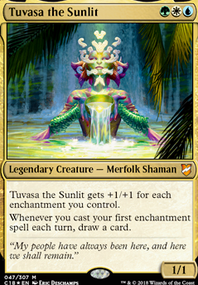 Some way to make Tuvasa (or anything else) unblockable would be good. A Flitterstep Eidolon, Whitewater Naiads, or Thassa, God of the Sea. 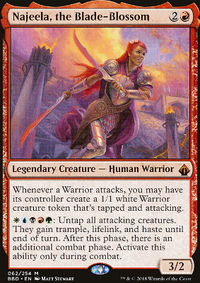 And if you plan on bouncing your creatures, maybe something like Cathars' Crusade could be useful? 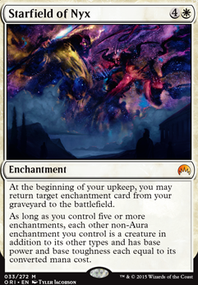 There's also ways to turn your enchantments into creatures, like Starfield of Nyx. I also see 0 cards with Constellation or Bestow. 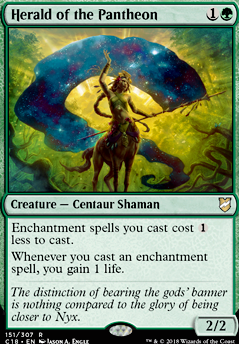 Eidolon of Blossoms could be nice to add to your cast-enchantment-and-draw-card cards. Herald of the Pantheon is also pretty cooooooooool. As is Kestia, the Cultivator. And not sure if you're into combos, but Enchanted Evening and Ajani's Chosen go infinite and are pretty good on their own.